The hot air balloon systems and components shown on the linked pages below, are all available for immediate sale. They may be currently in the possession of owners or dealers. AX-1 & 2 Up to 8,829cf Sorry, no listings at this time. AX-6 42,378cf to 56,504cf Sorry, no listings at this time. AX-9 105,944cf to 141,258cf Sorry, no listings at this time. AX-10 141,258cf to 211,877cf Sorry, no listings at this time. Special Shapes & Appendage Balloons Sorry, no listings at this time. Gas Balloons Sorry, no listings at this time. Burners Sorry, no listings at this time. Tanks Sorry, no listings at this time. Trailers Sorry, no listings at this time. Vehicles Sorry, no listings at this time. Fans Sorry, no listings at this time. Used parts, Type Certified updated: 7-13 VISIT OUR ONLINE GARAGE SALE! All equipment is fully guaranteed to be as represented by the ads. In addition, everything we sell has been, or will be inspected by an Aerostar authorized Factory Service Center. 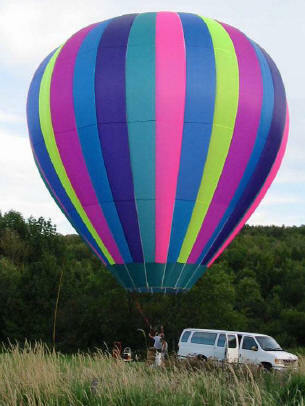 Owner assisted, pre-purchase inspections are also available through Stumpf Balloons Repair Station RG5R170N. Stumpf Ultralights Volumes from 20,000 to 69,000cf. Average envelope weight for a 54 is under 100lbs. 1.3oz silicone fabric. Smooth or bulbous gore patterns. Nomex panels and skirt/scoop options. Parachute tops. Configured for seats or small baskets. Stumpf Experimentals Experimental category balloon systems can carry passengers (non-paying), and be insured and flown at balloon festivals. I'll build a beautiful, lightweight envelope to fit any lower end. If you have a nice lower end sitting around a would like a super-lightweight envelope for it , give me a call. <<CLICK PHOTO TO CHECK OUT OUR PADDED TANK COVERS.